Home »Movies»Mind The Gap»Mind the Gap: You Haven’t Seen Predator? We at Deadshirt like to fancy ourselves pretty dedicated to popular culture with a combined knowledge of all things media that borders on the encyclopedic, but no one is perfect. There’s just too much music, too many films, too many comics, and way too many television episodes out there. No longer will we have to harbor the secret shame of not having experienced an expected work. Here is where we fill in the missing gaps. This week we look at the film Predator, with Contributing Editor Cameron DeOrdio. I’ll admit, I came into this “first-ever” viewing sullied, and I’m not just saying that because of my (un)healthy dose of Catholic shame. I knew what I believed to be quite a bit about Predator going into this, because it’s such a big part of pop culture, or at least the parts I frequent. The Predator is one of Archer’s greatest fears, and Alien vs. Predator, an absurdly contrived movie, came out just as I was becoming an obnoxiously snarky teenager and my thirst for absurdly contrived stories to make me feel superior was at its height. Now felt like as good a time as any to see the movie where the magic all started. I knew what to look for. So I came into this movie expecting the thoughtless shoot-‘em-up shtick I associate with ‘80s Arnie, and, while I did get a fair amount of that, I was pleasantly surprised by how well done so many things in this movie were. First off, and this isn’t really a credit to the movie or anything, but I totally forgot/never knew Jesse “The Body” Ventura was in this movie. Two future governors in an action-horror flick has to be some sort of milestone, I think. I also learned that Ventura totally stole the title for his autobiography from this movie. As for the accolades the movie actually earns, I will say the first thirty minutes or so are a solidly average Action Dudes in the Jungle movie, which is definitely a genre, with early hints that something is super not all right. Something is super not all right. Predator, as you may be aware, is the story of a group of men sent on a search-and-rescue mission in the Central American jungle. The mission is organized by Dillon (Carl Weathers, with a mustache shamed by Jesse Ventura’s), an old military companion and estranged friend of Dutch (Arnold Schwarzenegger, with his most passable almost-American accent ever) and is disrupted when an extraterrestrial super-warrior starts hunting the team for sport. We never see Hawkins’ (presumably flayed, almost certainly de-skulled) corpse, and that is what sells me on the horror and the competency with which it is being handled. The levels of mutilation and violence implied in this scene are literally unspeakable. That level of restraint is all too rare in movies, which often want to show you what crazy, messed up thing the director, effects artists, or whoever else could come up with. After that moment, I am 100% along for the ride. The horror aspects aren’t the only highlights, though. 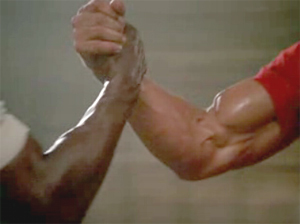 Predator exhibits a carefully designed structure that caught me off-guard with its attentiveness and elegance, especially for a movie that spends the first five minutes making sure everybody has at least one line about how our protagonist is the best, most capable badass to ever walk the planet, during which we’re treated to a couple lingering bicep shots. Arnie’s right arm actually got its SAG card for this role. That brings me to a bit of a tangent, but something weird I noticed. 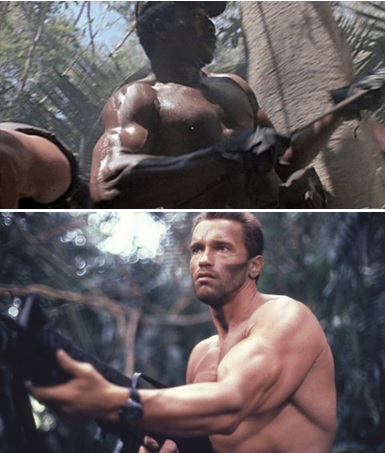 I encourage you to give Predator another viewing with this in mind: Sleeves are for assholes. The amount of audience goodwill a character is supposed to have is inversely proportional to the amount of sleeve he is currently wearing. (I say “he,” because the exactly one woman ‘80s law allows in this kind of movie isn’t much of a character.) When we first meet Dutch, he’s wearing a short-sleeved polo, and we are just starting to like him. He ditches the sleeves once he gets in the jungle and has had some time to establish his protagonist credentials. Dillon meanwhile, is wearing long sleeves from the start, and we – and Dutch – mistrust him. It’s not until he finally accepts that his fate lies with Dutch and his men that we’re allowed to embrace Dillon, and that’s when he stops wearing sleeves, after a brief time in short sleeves when we’re unsure about him but things seem on the mend. Billy (Sonny Landham) never wears sleeves, and we like him from the start, as long as we can overlook his painful collection of Native American stereotypes. It holds for the other characters, too. At one point, Dutch and Dillon take off their shirts to set traps, cementing their reestablished trust and exhibiting maximum sleevelessness. The pinnacle of this, for me, is when the team first realizes the thing killing and flaying their comrades is nearby and invisible, and they just start clear-cutting the rain forest with machine gun fire. They’re panicking, in a very real and human way (realistic emotional responses is another aspect in which I feel Predator exceeds other films in its genres). Later, when Dutch is coated in river mud, rendering him invisible to the Predator, and attacking the alien warrior, the Predator begins blindly firing all around itself, perfectly mirroring the human team’s earlier terror. That’s not just good structure, that’s good characterization, conveyed on behalf of a being whose face we have not yet seen and is the film’s clear antagonist, something you wouldn’t expect from a movie set up like a sci-fi creature feature. Instead of the chintzy sci-fi rework of Creature from the Black Lagoon I was half-expecting, Predator provides a thoroughly enjoyable, beautifully structured and occasionally scary movie even fourteen-year-old me would admit to liking without a hint of embarrassment. Though it’s slathered in tropes and Muscle Sheen, Predator’s characters feel real, even if they are mostly gargantuan Action Men, and their fear conveys the Predator’s threat more effectively than any number of skulls being callously yanked out by the spinal cord ever could. I’m glad the filmmakers had the foresight to give us both. Make sure to check out more installments of Mind the Gap!